After yesterday’s love letter of sorts to East Fife, today was the real business. A win for East Fife in Cumbernauld would guarantee the League 2 title, promotion back to League 1 and general unencumbered happiness in the Methil ranks. This was my second trip to Cumbernauld, the first being a frustrating 1-0 play-off semi final first leg defeat in 2014. Today would bring no more goals for East Fife, but a whole lot more pleasure. The 90 minutes were filled with tension and the odd excitable outburst from my good self. While East Fife had arguably the better chances in the game, with Kevin Smith getting the ball caught under his feet as East Fife broke midway through the first half, Clyde perhaps circulated the ball better than the Methil men. Clyde’s five yellow cards also (rightly) suggested that they were the less well-disciplined of the two sides. The home side’s two enormous centre-halves (who were both yellow card recipients) were able to stifle Nathan Austin’s aerial threat in particular – the wonderfully gangly striker only really able to bring his skills to the fore when the ball went into his feet. To Gary Naysmith’s credit, with 15 minutes to go and the scores still level at 0-0, he threw on Jamie Insall to give Austin some support and to seek a winning goal. As the Fife fans furiously checked Livescore on their phones (other football apps are available), and other results fell beautifully in East Fife’s favour, there were some slightly premature chants of “Champione” going up from the sizeable away support. Both sides still sought the winner, but about 30 seconds before Colin Steven blew for full time, suddenly all 554 of the East Fife fans in Cumbernauld knew the draw would be enough. When the final whistle arrived, the relief and joy were glorious – I don’t think I’ve ever enjoyed a 0-0 draw more. East Fife’s exemplary finish to the season had brought another moment to add to those I listed in yesterday’s post. As my wife said on the way back to the car, Cumbernauld would, strangely, be another of those places that would hold meaning for me for the rest of my football-supporting life. As an aside, there has to be an honourable mention for Podge. An East Fife fan who I’ve never not seen at a game I’ve been to (and who my grandad always asks after), he was for some reason singled out by one of the overly-enthusiastic Clyde stewards when there was a small and well-mannered pitch invasion on the final whistle. The steward did his best to lie on Podge, but Podge escaped, drew the applause of the crowd, then fell on his arse – to be fair to him, he wasn’t the first person to slip on Clyde’s artificial surface. Quite frankly, it was a hilarious way to finish an outstanding afternoon in North Lanarkshire. I’m sometimes asked, and it tends to be by people who profess love of a football club several hundred miles from their place of residence, why I support East Fife. And in a way I can see exactly why that question is asked. 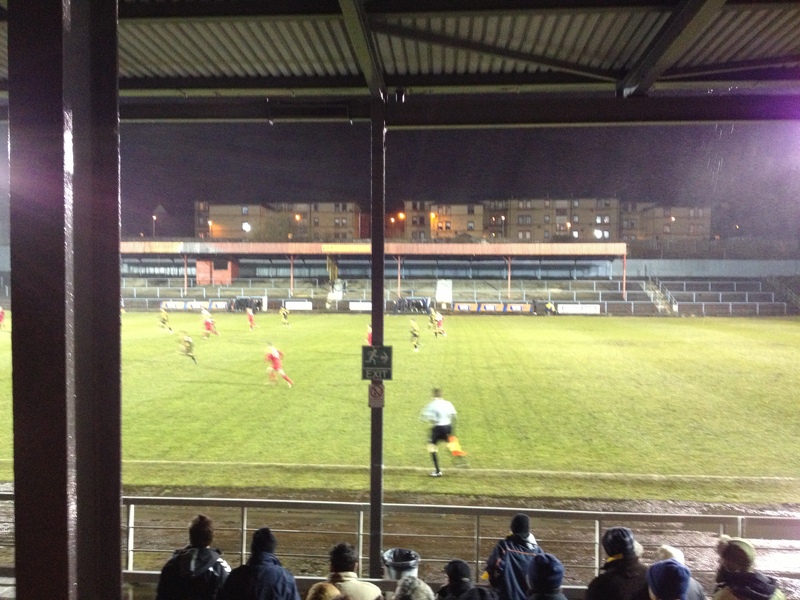 East Fife play in a tiny (1,980 capacity) and very cold stadium at the more neglected end of Fife, away from any good quality transport connections with the rest of Scotland. They currently reside in League 2, the lowest of Scotland’s four professional (and semi-professional) divisions. East Fife are a part-time team and have been throughout the time I’ve supported them. But, and I’ve said this to a great many people recently, as far as I’m concerned nothing, nothing beats an East Fife goal. Clearly part of the joy in supporting a small team is that success happens so rarely. You are faced with potentially years (or decades if you’re a Shire supporter) of your team scrapping towards the lower end of the Scottish Professional Football League with nothing to show for it. So when that moment of success does come, it is genuinely a beautiful thing. I have experienced three such moments in my quarter of a century supporting my local team. The first was in 1996. While I wasn’t there to witness the very moment in person, under Steve Archibald’s exemplary management East Fife were promoted to the second tier of Scottish football. 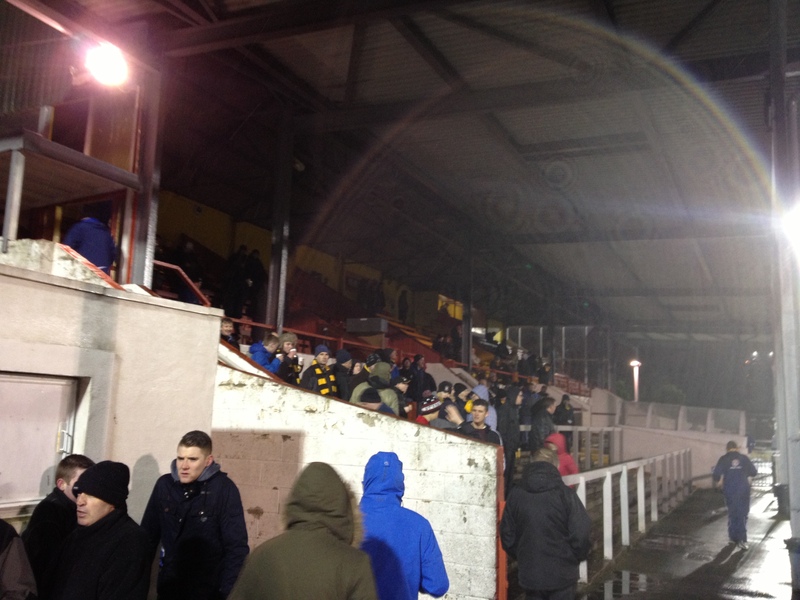 A 2-2 draw away to Clyde (having been 2 down) was enough to seal the deal and leave East Fife second to Stirling Albion. The less said about the following (1996-97) season – Archibald’s subsequent departure, his replacement Jimmy Bone being largely awful and a record of P36 W2 – the better. Round 2 came in East Fife’s centenary year, 2003. Now in the Third Division, East Fife were locked in a three-way tussle with Greenock Morton and Albion Rovers for the two promotion places. As East Fife sat in second prior to the last game of the 2002-03 season, a win in that game against Queen’s Park would suffice to guarantee promotion. As I was to discover, 89 minutes wanting a goal while watching largely insipid football is horrendous. But when that goal comes, my god. The moment is incredible. Especially when it involves East Fife. As we threw men forward looking for that goal, the ball broke to Gordon Love (one of several Gordons in the East Fife squad). His flick through found that season’s top scorer and general East Fife hero Kenny Deuchar. His subsequent dink over the QP goalkeeper sent everyone mad. I elbowed a good friend of mine in the face (accidentally) while celebrating. The moment was just that good, as was going on the pitch at the end of the game and shaking hands with various Fife players. Only promotion had been achieved (Morton took the title), but promotion of itself was more than sufficient. The third came in 2008. East Fife’s trip up a league in 2003 only lasted one season. After a few years mooching about in the lower half of the Third Division, the arrival of new chairman Willie Gray and some of his money saw a glut of good lower league pros arrive at Bayview in 2007. By the middle of March 2008, we were in the position where a win at East Stirlingshire’s wonderfully rickety old ground, the much-missed Firs Park, would be enough to win the league. Did East Fife hold up their end of the bargain? Of course they did. A crowd of 864 (mostly Fife fans) crammed into the ageing enclosure overlooking Falkirk Central Retail Park to witness a 3-0 victory. The league was won – East Fife being the first side in Britain to win a league title that season. The game where the trophy was handed over, a 2-1 procession against Arbroath, was just as good, and for the first time in my life I saw an East Fife captain (Steven Tweed) lift a trophy. Myself, my brother and my dad (left to right) with the Third Division trophy, suitably ribboned up. So what inspired this post? It so happens that East Fife are on another of those wonderfully rare runs. 7 points clear at the top of League 2 (the former Third Division – having been relegated in 2014), a win away at Clyde tomorrow will be enough to get us another league title and promotion. Indeed, one win from the last three games will be enough. That’s why I support a small team. Because through all the Kevin Steele corners, the horrific long ball football and the Arctic conditions at New Bayview in any month of the year, when success comes, it is to be absolutely savoured. The rest of the time, the gallows humour and the occasionally hilarious outbursts of Fife fans is enough to get us through. I can’t wait for tomorrow, but win lose or draw, I know an East Fife goal is the only one I will celebrate with my heart, my head and any other organs you might care to mention. Football is so often about choices. As something of a “check Livescore every Saturday” East Fife fan so far this season, I initially set off for Haymarket station on Saturday afternoon with half a mind to catch a train to Yoker to see Linlithgow Rose in action, in the quarter finals of the Scottish Junior Cup. However, on noting that I still had about enough time to travel to Methil to see the team I’ve supported for almost a quarter of a century, I thought it only right that I take in my first East Fife game of the 2014/15 season. As far as choices go, going to Methil was an excellent one. Having purchased an inexpensive jacket at Peacocks on the Shorehead (probably the first clothes I’ve bought or had bought for me from a shop in Leven since about 1997) to make up for the fact I’d misjudged the warmth of the March sunshine, I made my way to New Bayview and met up with Daniel, my cousin and godson (lucky chap) to take in the afternoon’s proceedings. The first 15 minutes or so of the game produced a couple of good chances for Arbroath, with headers being flashed wide. East Fife slowly took control of the game in the middle of the park, however, and should have taken the lead in the 22nd minute. Young midfielder Ross Brown was felled in the area after three quick chances had gone begging for the home side. Derek Riordan, once of Hibs and Celtic, took the spot kick but unfortunately hit it straight at the Arbroath keeper McCallum. Mr McCallum was somewhat lucky to still be on the park having taken out Brown. The remainder of the half played out in much the same way – East Fife largely in control and drawing yellow card inducing fouls from their opponents. One of those on 45 minutes saw Riordan make up for his miss from 12 yards. He hit a direct free kick from the edge of the area low, around the wall and into the back of the net. McCallum got a hand to it but to no avail. The second half was largely defined by Arbroath having set pieces comfortably dealt with by the home defence. Corner after corner was well cleared, the only hairy moment coming from a Bobby Linn free kick which home goalkeeper Millar fumbled. His follow up save to deny Whatley however was outstanding. East Fife continued to hit Arbroath on the break, and that counter attacking finally paid off in the last minute. Good work from sub Alan Cook down the left saw him roll the perfect square ball to fellow sub Caolan McAleer, who made no mistake in knocking home the second and guaranteeing the Fife three very important points. McAleer celebrated exuberantly with the fans, and was then booked for his troubles, by which point nobody really cared. In all, a thoroughly professional performance from the home side. New signings Riordan and Dickson played well, while Ross Brown and Nathan Austin have clearly grown in bulk and confidence since last season. A positive result then for me to take back on the inordinately long bus and train journey to Edinburgh, and a 100% record for the season. In a slightly blatant copy of the Football Ramble’s Dean Windass Hall of Fame, I thought I’d start an irregularly regular series in the same vein, describing those players who for some reason hold something of a special place in my brain and stomach. There are no special entry criteria, and like the Ramble I might branch out into tournaments, stadia and squads as time goes on. Plus, it gives me something to write about when I haven’t been to see Linlithgow Rose in a while, or nothing otherwise piques my interest. The obvious place to start then is the man who the Benny Andrew Hall of Fame is named after. Benny Andrew. 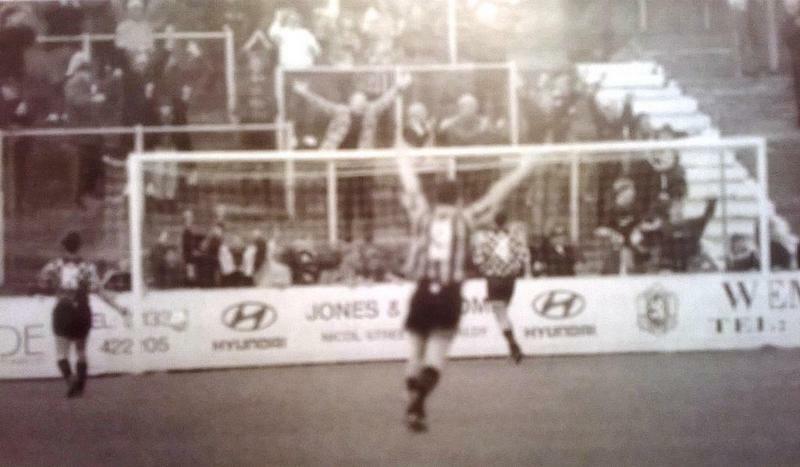 Mr Andrew has earned his eponymous Hall of Fame for one reason – on an October afternoon in 1996, he scored an absolute screamer against a Chris Waddle-inspired Falkirk to help East Fife, the team I have supported since 1990, to their only home league win of that season at the sadly-missed old Bayview Park. To go into it in a little more detail, from what I can remember 18 years later, after a long ball forward and a Falkirk defensive header, the ball sat up beautifully for Andrew to strike on the volley from quite a distance outside the penalty area. That he did, and the ball arced magnificently into the keeper’s top left corner to give the Fife a 1-0 advantage after 11 minutes. That 1996-97 season was otherwise a disaster, the first and only one we have had in the Scottish second tier since I became an East Fife fan. We finished that season with a record of P36 W2, but to be able to witness THAT goal and rip it out of Chris Waddle was magnificent, on the way to a precious 3-1 win. What of Benny Andrew himself? That goal was such a shock because, though a forward, Andrew didn’t score many goals at all. A tendency to miss the target saw him grab only 8 goals in 109 league games for the Fife, despite ostensibly being a striker. Though that’s what made the Falkirk goal all the more special – it was wonderful and a complete surprise. After his time at East Fife and a spell at Montrose, Benny arguably found his level and stayed at Glenrothes FC, the new town’s representative in the Scottish Junior ranks, for more than a decade. He has now become the manager of said Junior team, who are currently struggling a little at the lower end of the East Premier League. In any event, whatever comes of his managerial career, and I’m sure we all wish him every success in that, as far as I’m concerned Benny can dine out on that magnificent goal for life. Anyone with a good photo or story about the man himself, as well as any suggestions about future posts, feel free to leave a comment. I can be a bit self-contradictory sometimes. Give me the choice between watching a Manchester United match on the telly and going to Old Trafford, and I’d bite your hand off for a seat in the Stretford End, despite their relatively terrible season. Today, however, I was far more excited about East Fife, my team since I was 6 years old, appearing on live television for the very first time. As such, my viewing was to be had in a pub in Edinburgh rather than in a cold seat in the east of Fife. The match in question was against Rangers, who are of course currently running away with League 1 in their quest to get back into the Scottish Premiership as quickly as possible, while spending money far beyond what is necessary to get out of part-time leagues. The game was on BT Sport, who are of course the new kid in town as far as sport channels are concerned. Their presentation looked decent, with two of our players strangely being taken out on a car-drifting course during the pre-match build-up. The audience was also introduced to the East Fife squad and their various nicknames. The match itself produced a gutting, last-minute penalty win for Rangers. While East Fife didn’t create a great deal, they kept Rangers at bay excellently until the last. It was fantastic to see my team on the telly, with Methil and its environs looking rather pleasant in the crisp wintry sunshine. Surreal it was, but I was a proud man to see my home town team put in an excellent display in their first ever live game. I hope it won’t be another 24 years before I see us live on the TV again. The second Saturday in January is never the ideal time to visit New Bayview. Any time of year, the ground is famously cold as the breeze whips off the Firth of Forth but in winter it’s all the chillier. As it was, this Saturday, I attended my third East Fife game of the season in the Methil bite , dragging two of my younger cousins (Daniel and Greg, who support Celtic and Arsenal respectively) along for the occasion. The match was one which lived up to that classic football cliché – a game of two halves. The first half began with East Fife looking sluggish and a little lackadaisical on the ball, and Brechin taking the match to their opponents as a result. Brechin were on a run of four straight victories and it looked like a fifth was on the cards when they opened the scoring after 5 minutes. David McKenna’s lofted cross/shot rebounded off the post, with the defence and keeper seemingly expecting the ball to drift wide. 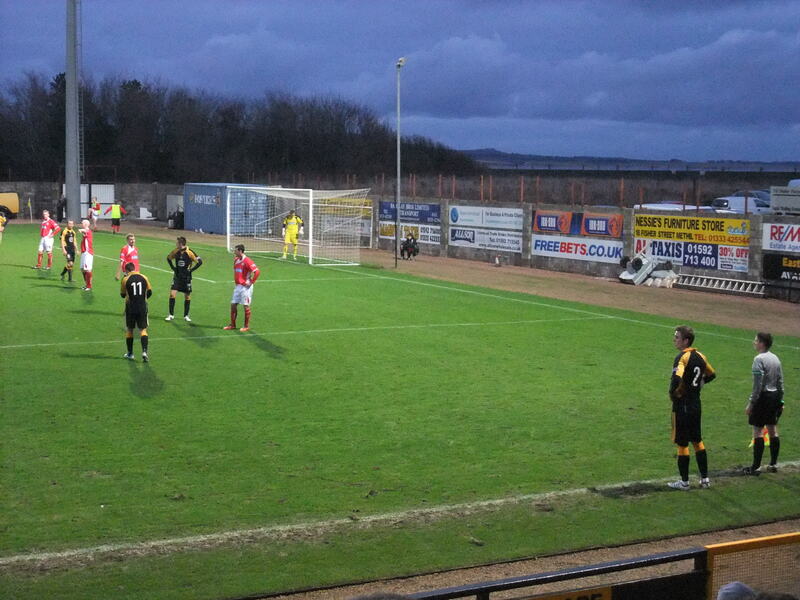 Alan Trouten capitalised on the hesitancy in the East Fife defence, smashing home the rebound for 1-0. Brechin then proceeded to create a further number of chances, taking advantage of East Fife’s slightly slow response to Brechin’s counter-attacking play. 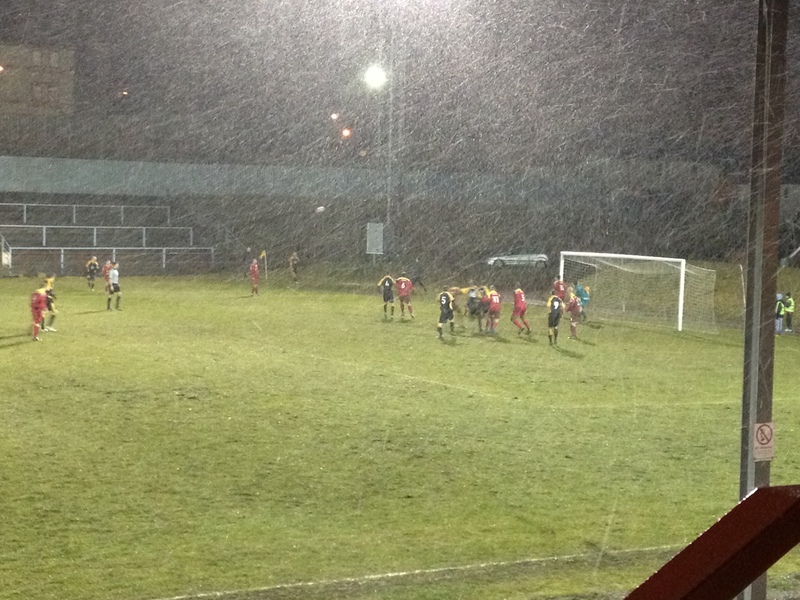 However, East Fife grabbed the next goal. A Darren Smith corner was met by the head of Collin Samuel to bring the home side level. The Trinidadian striker unfortunately had to go off injured not long after. What also occurred not long after was a second Brechin City goal. Another quality counter-attacking move, with a tight offside decision being called the right way saw Derek Carcary put through on goal and making no mistake in sliding the ball under Calum Antell for 2-1. Daniel, Greg and I then made the collective decision, on about 35 minutes, to go for a pie to beat the half-time queue. Having acquired our traditional football refreshments, we made our way back into the ground, missing Bobby Barr’s apparently brilliant equaliser by about 10 seconds. Given the descriptions of it as a 25-yarder into the top corner, to say I was a bit gutted would be an understatement, though I look forward to seeing it on the East Fife website’s excellent video coverage. Half-time arrived with East Fife having been much the poorer team but somehow level at 2-2. 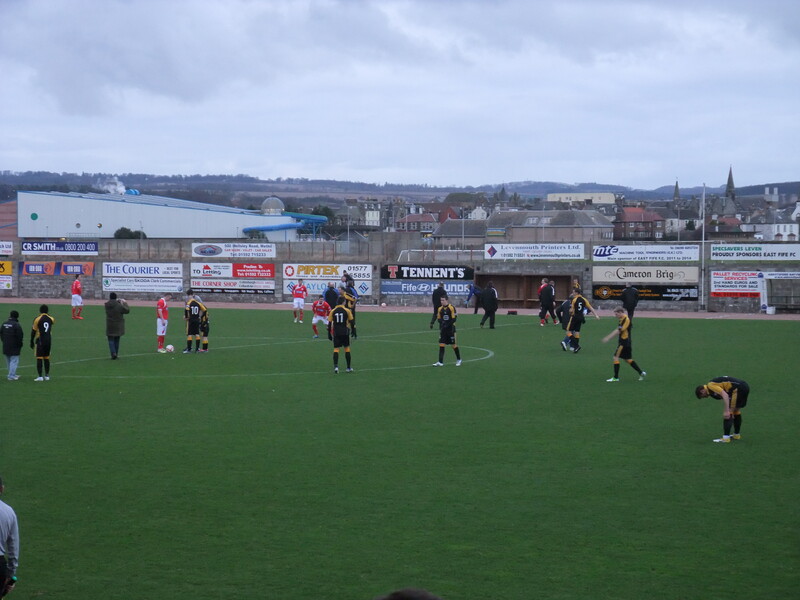 The fans expected the men in black and gold to receive their traditional half-time reprimand from Billy Brown, and so it was that East Fife came out and mostly dominated the second half, without, unfortunately, finding a winning goal. Chances came during the second half for Scott McBride on several occasions and for Paul McManus on one very notable occasion to give the home side the lead. There was some lovely combination play and passing on show from the Fifers, but unfortunately no-one could apply the decisive touch. As well as that, the stand-side linesman made some particularly ropey decisions, one when a ricochet off a Brechin player broke to Paul McManus who was subsequently called offside, another when goal-kick was signalled after Andrews had touched a McBride effort over the bar. As the half wore on, Brechin came back into it and looked as though they would apply the sucker-punch on 85 minutes when the ball fell to Andy Jackson with the goal at his mercy. Somehow he managed to skew the ball wide, and in the end, 2-2 looked like a pretty decent final score for all concerned. East Fife’s second-half performance must have given Billy Brown some encouragement – he will be hoping the Fife can do that for a whole game against Alloa next week. It was time to head back to the car and warm up.